NVIDIA, the world leader in visual computing technologies, seems to be getting ready to launch two new video boards which have been rumored for quite sometime. According to the company’s configurations file of beta drivers, NVIDIA is all geared up to release the dual-GPU GeForce GTX 590 and the GeForce GTX 550 Ti graphic cards. Even though the GTX 590 have been rumored for long with spec leaks coming every other day, the GTX 550 Ti is an entirely new graphics card based on the GF116-400 graphics processor. 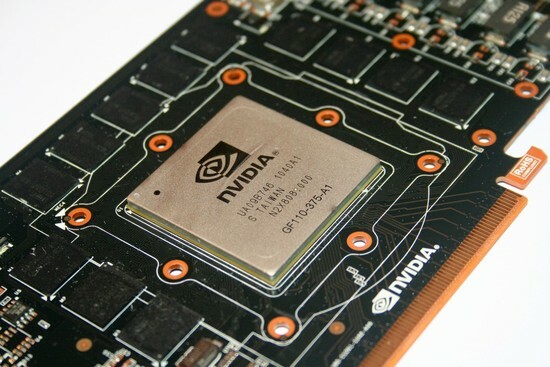 The GTX 550 Ti would be the first Nvidia model to based on this GPU model, due to which no details are available but it does feature 1GB of GDDR5 memory. Whereas the company’s cheapest model in NVIDIA’s GTX 500 family is the GTX 560 Ti, priced at $250, the new card is expected to retail for somewhere in the vicinity of $200. On the other hand, we do have some specs related to the GTX 590, which comes with the powerful dual GF110 GPU as well as a massic 3GB of GDDR5 video frame buffer. Moreover the graphic card is built using hand-picked GF110 cores and packs 1024 stream processors, 128 texturing units, 96 ROPs and dual 384-bit memory interfaces. The graphic card is designed surely to compete with AMD’s Radeon HD 6990 GPu which is also expected to arrive in the first quarter of 2011.